We’re very pleased to announce that a preview release of RStudio IDE v0.98 is available for download now. Major highlights of the new release include debugging tools, many improvements to environment/workspace browsing, and a new way to create HTML5 presentations using R Markdown. As usual there are also many small improvements and bug fixes. We’ll talk about some of the more interesting new features below, otherwise check out the release notes for full details. Note that execution is stopped at the specified breakpoint, the environment is updated to show the objects within the context where execution was stopped, and commands for line by line stepping, continuing, and aborting the debug session appear in the console. 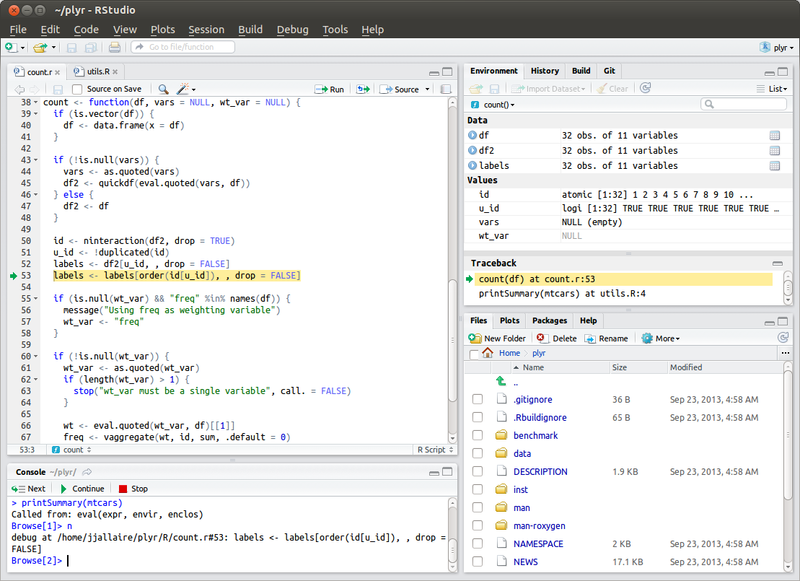 For more details on how to take advantage of the new tools, see Debugging with RStudio. For more details see the documentation on Authoring R Presentations. An administrative dashboard that provides insight into active sessions, server health, and monitoring of system-wide and per-user performance and resource metrics. Authentication using system accounts, ActiveDirectory, LDAP, or Google Accounts. Full support for PAM (including PAM sessions for dynamically provisioning user resources). Ability to establish per-user or per-group CPU priorities and memory limits. HTTP enhancements including support for SSL and keep-alive for improved performance. Ability to restrict access to the server by IP. Suspend, terminate, or assume control of user sessions. Impersonate users for assistance and troubleshooting. The Professional Edition also includes priority support and a commercial license. You can get more details as well as download a free 45-day evaluation version from the RStudio Server Professional Preview page. The preview release is feature complete and we expect to release the final version of v0.98 during the next few weeks. After that we’ll be focusing on adding features to make it easier to develop and deploy Shiny web applications and expect another release with those features before the end of the year.